Yes, I admit it. 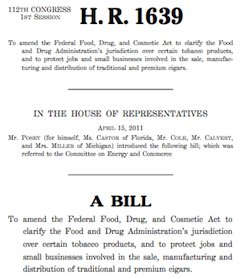 I’m a little obsessed over HR 1639, the bill to bar the Food & Drug Administration from regulating premium, hand-rolled cigars. Frankly, though, I cannot understand why every cigar smoker isn’t. I believe enactment of this legislation would offer extraordinary protection for cigars smokers and the cigar industry. By recognizing a specific category for premium cigars, it would make it easy to exclude them from future tobacco taxes and restrictions. The good news is the bill is tantalizingly close to the support it needs for passage in the House of Representatives. But now is not the time to let up. Soon, the solons will be off for the summer and for campaigning. Little will transpire on Capitol Hill. The bill has just over 180 supporters, but, alas, Guam’s representative has no vote, and David Wu resigned after signing on. I’ve recently spent time analyzing the list of cosponsors and discovered some interesting data. What’s most interesting is I think it can help push the bill to enactment. And maybe it’ll inspire more readers to get in touch with their representatives and urge them to get on board. As you’d expect, Florida has the most supporters. Still, only 18 of its 25 representatives are signed up. Next up, Pennsylvania, undoubtedly second only to Florida for cigar shops and retail sales, and Texas, are tied with 13. Again, that leaves quite a few who aren’t on board in both states. Surprisingly, the state most identified with tobacco, Virginia, has under 50% signed up, with 5 of its 11 representatives sponsoring the bill. Granted, most of the state’s tobacco connection involves cigarettes, but General Cigar Co.’s headquarters are in Richmond. And Connecticut, home of the eponymous high-quality wrapper, has but 2 of 5 representatives as cosponsors. Five states, admittedly all small, have seen all their representatives endorse HR1639: Arkansas (4), West Virginia (3), Kansas (4), Hawaii (2), and New Hampshire (2). Three times that many states have no representatives on the list. They’re generally concentrated in New England and the West: Massachusetts (10), Rhode Island (2), Vermont (1), Maine (2), New Mexico (3), Montana (1), Idaho (2), Utah (3), Oregon (5), Washington (9), Wyoming (1), Alaska (1), North Dakota (1), South Dakota (1), and Delaware (1). While Republicans outnumber Democrats among supporters by about 3 to 1, the bill has strong bipartisan support. Just consider those states that are fully signed up: Arkansas has 3 Republicans and 1 Democrat; West Virginia, a Democrat and 2 Republicans; Kansas, 4 Republicans; Hawaii, 2 Democrats; and New Hampshire, 2 Republicans. And it isn’t just the parties. Supporters include every point along the ideological spectrum, something well worth pointing out to anyone who isn’t a supporter. So, how can all this help? First, I hope you’re inspired by how close to passage this legislation is. Then, you can see how just a little more pressure applied at the proper points could push HR1639 across the finish line. If you’re a cigar smoker who hasn’t taken action, be sure to write, email, or telephone your representative if he or she isn’t a supporter. If you own a smoke shop and there are representatives in your area who haven’t signed on (I counted more than two dozen Massachusetts shops that are IPCPR members and 15 in Oregon, for example) invite them to your shop for an event where they can meet constituents, enjoy a cigar, and learn firsthand why this bill is so vital. You can find all the information you need about the bill’s cosponsors here and how to make contact here. Let’s get this bill passed. Then I can go back to obsessing over other important things, like humidity levels in the humidor. Just since I wrote this, the bill has picked up three more cosponsors. George, I'm not too familiar with the way a bill in the House works. Even if the 180 sponsors are met, won't the Senate and President still have to sign off? Any explanation would help! Chris – Yes, after passage in the House the bill needs to be passed in the Senate and signed by the president. Although it could hit a roadblock at either point, for a measure like this it is likely that passage in one chamber would ease the way for enactment. The focus right now is on the House and once it passes there, it will move to the Senate. Thanks for keeping this on the front burner for us. I have written my rep (Raúl Labrador ID) 2x by email without even an automated response(which I requested). I'm calling this time! Chuck – When you call, you might point out, since Labrador is a Tea Party guy, that one of those who signed on just yesterday is Michele Bachmann. Thanks for the top-notch analysis. Let's get this passed! Unfortunately, the bill has slim chances for passage overall. Even if it gets through the House — and I doubt it, just because there are much more pressing issues — it would never come up for a vote in the Senate, especially in an election year. That said, it does demonstrate to FDA officials that premium cigars are not where the govt needs to spend a lot of its regulatory muscle. Mike – Actually, I think it has a decent chance to become enacted. My guess as to what's likely is that it will get attached to another, bigger bill likely to win approval in both chambers and get signed. It's also possible FDA will withdraw its proposal rather than face a congressional directive, which would be good but not as good because the proposal could always be re-introduced. This was an excellent article. Just wanted to add one small thing at the end. If you are a store owner, don't be afraid to try to organize a fund raiser for your congressman, as opposed to just a store visit. If you have an heavy hitters who can help raise some funds, this is always something that they appreciate. Since this post went up, Wyoming's lone representative has signed on, as has a representative from Oregon. jnjgttuphjfhvzt, , rygScEG, [url=http://www.dapoxetineguide.com/]Is dapoxetine available[/url], EzArvCA, http://www.dapoxetineguide.com/ Order dapoxetine online, EWSXQnE. urckltuphjfhvzt, Online poker sites, dcTyMKv, [url=http://einformationorganizer.com/]Online Poker[/url], DorxuyD, http://einformationorganizer.com/ Real money online poker, tvaPwtk. gvphatuphjfhvzt, Get followed on twitter, lIBhCyx, [url=http://worldkinggroup.com/]Real twitter followers wwwarticlesbasecom[/url], jayvGMa, http://worldkinggroup.com/ Get Twitter Followers, bddxqCX. Excellent in-depth report article from George, and good comments, including Jonathan Drew's. Congressman Posey created this bill and he is receiving outstanding bipartisan support.. He knows that premium cigars require lots of hard work and labor, is an important private sector, and some are for collection as well. This product does not need to get punished by ignorant few that consider these to be like all other tobacco products. Just like a bill to create jobs, you would expect this bill be passed if Congress has a heart or a brain for the US.